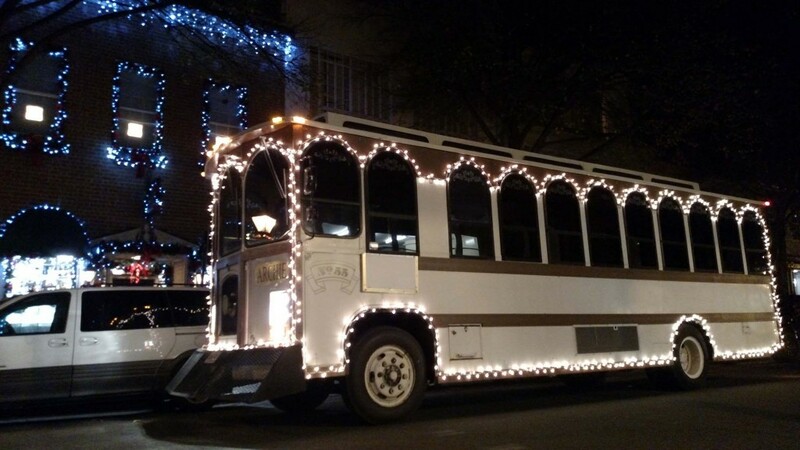 Celebrate the Christmas season with a trolley holiday lights tour. Gather family and friends or add us to your office party for a private charter. Hop aboard for a relaxing and fun time. We’ll do the driving while you enjoy the festive light displays and fill the trolley with joyous sounds of Christmas. Contact Trolley Tours of Fredericksburg at 540-898-0737 to secure your group reservation. Please Note: You should dress for the weather. The trolleys are heated but will not feel as warm as your personal vehicle. Group Rate: $250 per hour. Don’t delay. Dates fill up quickly! In addition to group tours, we’ll have regularly scheduled tours, beginning at 6:30 pm. They last approximately 1 hour. Tickets: Adults $10, Children (5-12) $5, Children 4 and younger ride free but may need to sit on an adult’s lap. Holiday Lights Tours begin at the Fredericksburg Visitor Center, 706 Caroline Street. Tickets are available online up until tour time.